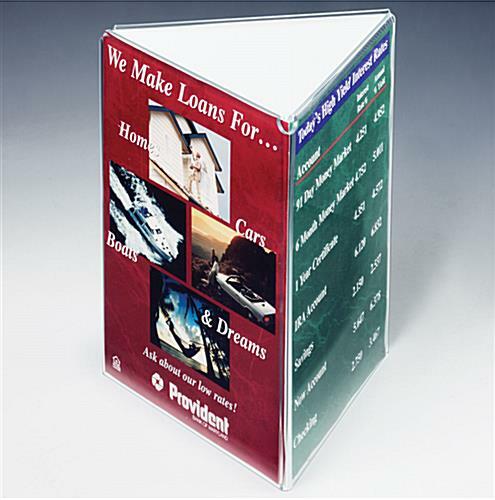 4" x 6" 4" x 9" 5" x 7"
Menu Display features Tri-Fold Design, 8.5" x 11"
This menu display is a large 8.5" x 11" acrylic frame. 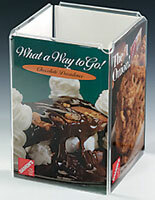 This table sign holder is a tri-fold stand with three fold-over panels. Place this menu display at a check-out area or on tabletops as an alternative means of listing food and drink listings. 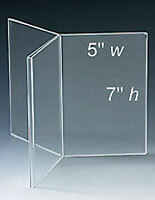 Each side can be used to display a different print, or insert the same sign into all three sides for multiple viewers. 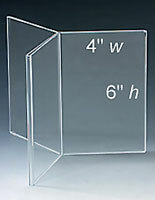 This menu display, also called a table tent, is made with clear acrylic. This construction provides an unobstructed view of the each sign panel. 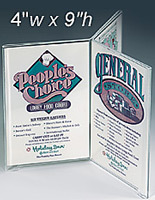 This acrylic sign frame is the ideal menu display for any casual dining facility. The triangular shape creates a hollow center area that can be used to store condiment bottles or other essential items normally kept on restaurant tables. 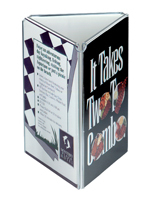 This menu display, multi-sided sign holder, can also be used in a lobby to post informational messages for visitors. The convenient 8.5" x 11" size makes it easy to create signage straight from a standard office printer. 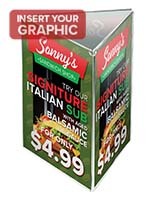 Place this menu display that is three-sided near a cash register or carry-out area to advertise current specials. 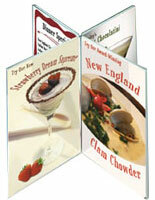 The extra large size, and tri-fold design is sure to capture the attention of guests and customers. This menu display is easy to change out signs in a very quick and orderly fashion. The bottom of each panel is open, allowing signage to slide out. 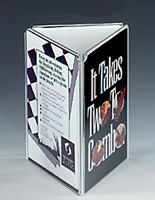 This menu display, also called a table tent, is offered in several other sizes in this online collection. Purchased these to go on tables at an annual meeting. We ordered 13 because we needed 12 and decided to order an extra one in case one was broken during shipment. When they came, two were broken and cracked. One side of one of the displays fell off completely. The rest looked great, just some random plastic/string on them. They replaced the two broken ones, but not in time for the meeting. Displays look good just need better packaging as it is unfortunate they broke during shipping. We are so sorry to hear that some of your products arrived this way, Tera! We surely do not expect you to settle for damaged goods. A customer care specialist will be reaching out to help you with a return or to help find a solution that works best for you. Thank you for bringing this to our attention. Ordered 5, and 3 arrived broken. Not packed well at all. Called yesterday and was told I'd receive an email about my refund. Still waiting for confirmation of my refund. We're sorry to hear this, Kate. A customer care specialist will be reaching out to assist you soon if they haven't already. Thank you for letting us know. Okay. But crippled by lackluster service. We ordered six of these for a waiting area and half of them arrived damage. They're big so a lackluster packing job means something breaking is more than likely to occur in transit, which is exactly what happened. Customer service isn't great either. We were promised replacements would be shipped within the next business day and that was more than a week ago. We ended up buying a similar model from Staples, which was a bit pricier but they came in perfect. Buyer beware. We're so sorry to hear your order arrived damaged! We've alerted the manager of our customer care specialists and someone will reach out promptly to assist you. Thank you for letting us know! This product was exactly as pictured and served its purpose well. We used it as an informational centerpiece on dinner tables at a corporate event, and it worked perfectly. That's great to hear! Thank you for the positive review! Fast shipping & a great product! Will order again. We're thrilled you're happy with the product and that you'll be shopping with us again, Christy! Thanks for taking the time to review.